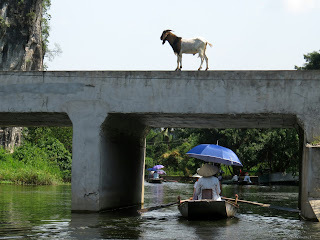 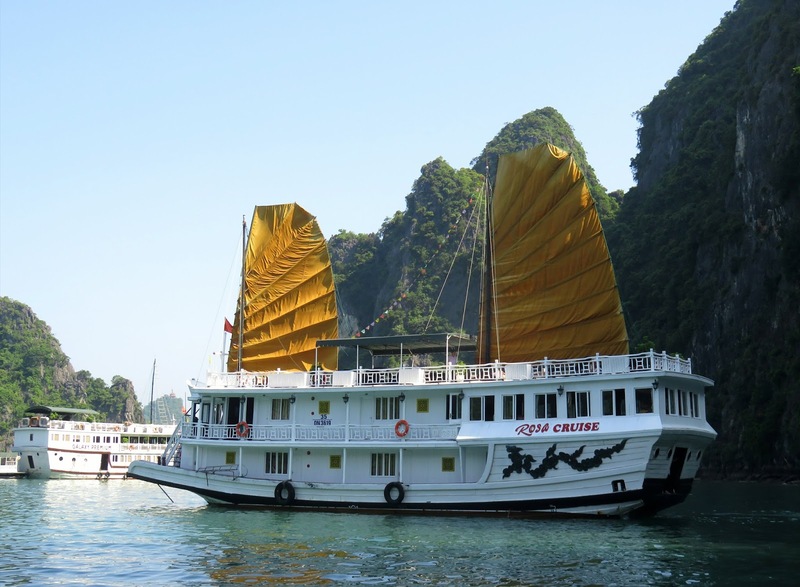 We decided to take a two day cruise on a junk with Rosa Cruises to explore the magnificent Bay of Descending Dragons (commonly known as Ha Long Bay). This was a beautiful small but luxurious boat with cosy bedrooms with double bed and tiny ensuite bathroom, dining/living room for about 12 people and an upstairs open area for viewing the scenery and doing the morning Tai Chi class. The bay consists of nearly 2,000 limestone islands topped with lush trees and greenery, looking like huge boulders dropped in the ocean by a marauding giant. 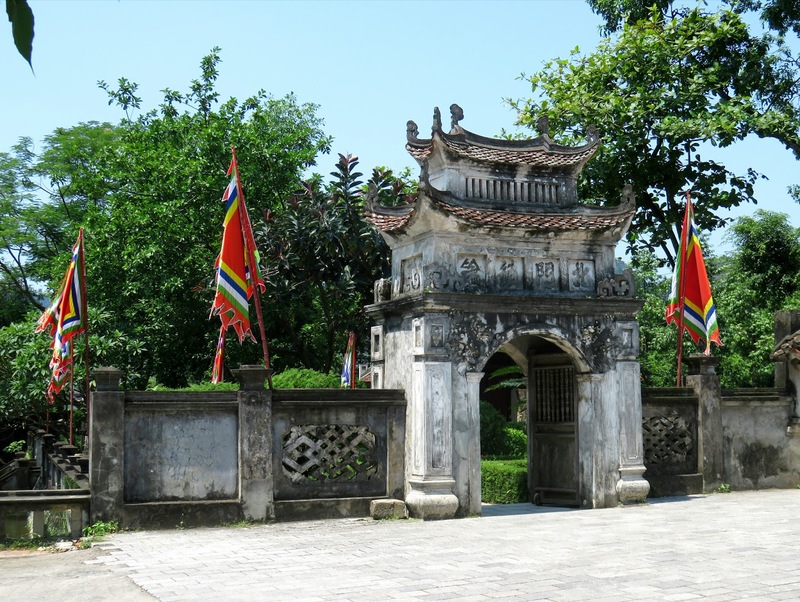 The story in Vietnam more runs along the line of a family of dragons deciding to stay around after protecting the local population from marauders. Some of the islands are hollow with caves. We visited the Hang Sung Sot cave. 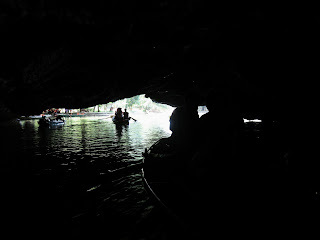 The cave was humungous, which was good considering the stream of people moving through it in single file. 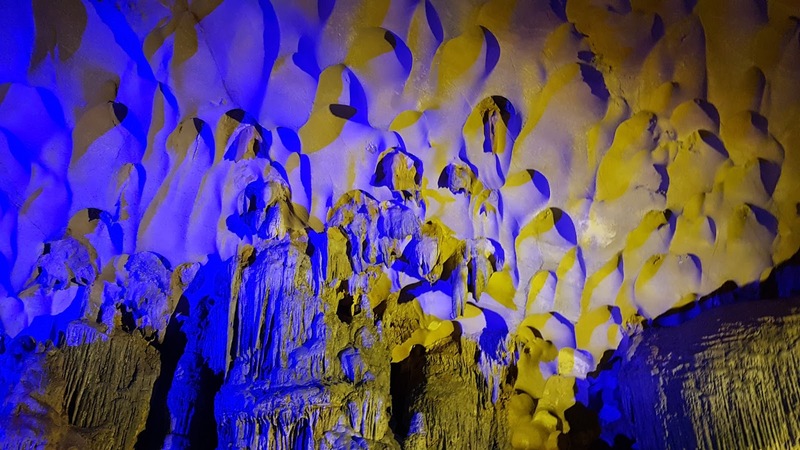 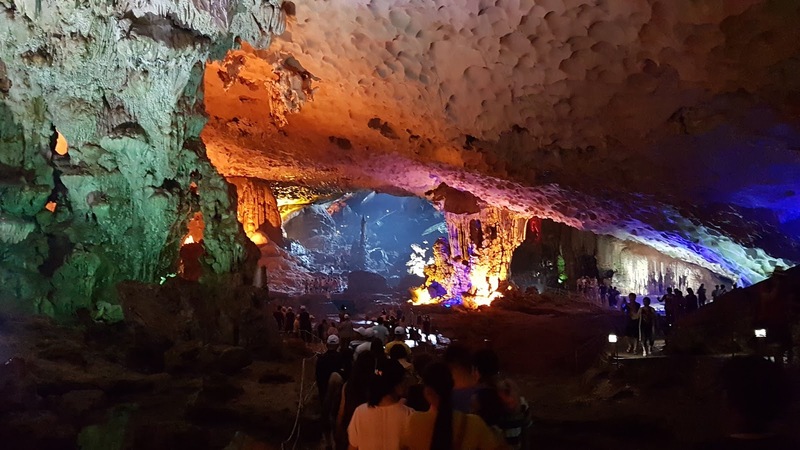 Large stalagtites and stalagmites and rock formations were lit with different coloured lights to give an expansive romantic feel to the whole experience, which included a panoramic view of the surrounding bay. 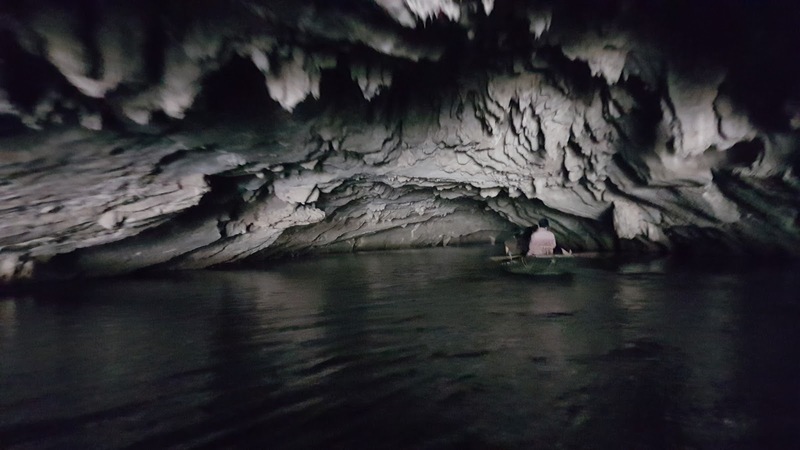 It took almost an hour to get through the cave. 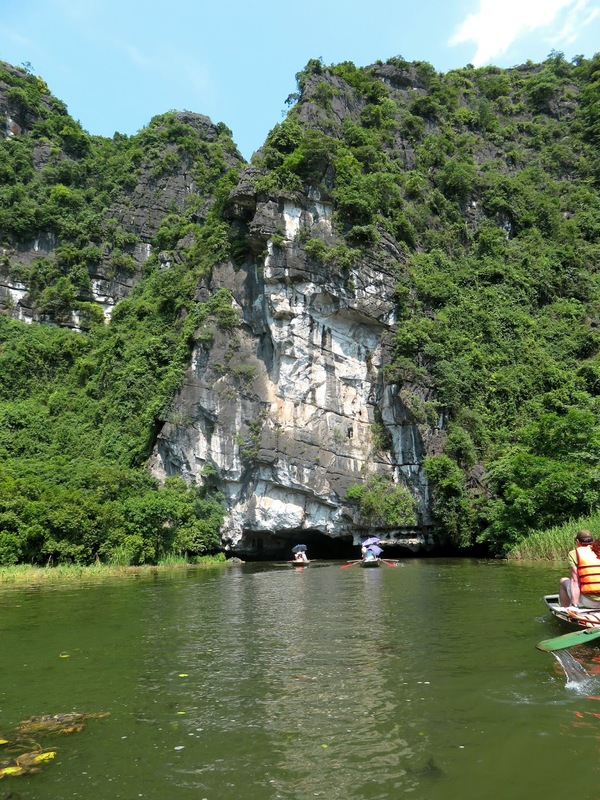 The days were filled with activities which included kayaking around one of the islands. 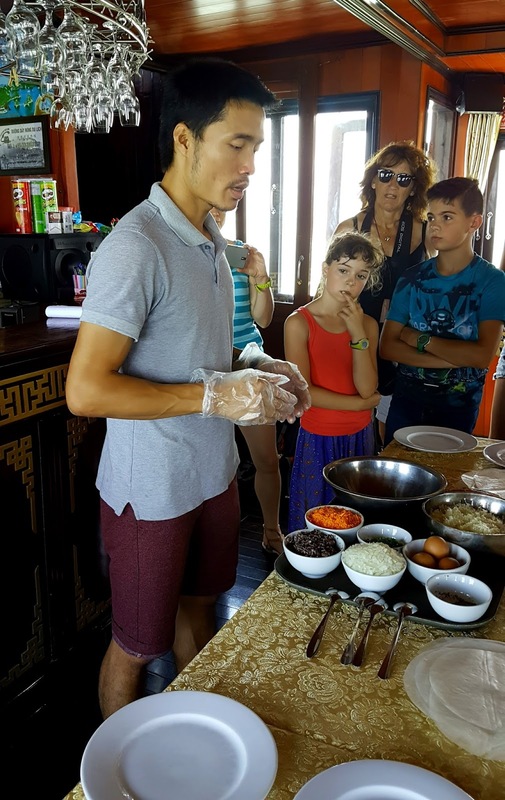 We were also treated to a cooking class making the fabulous fried spring rolls with rice paper that we made vegetarian and were naturally gluten free. 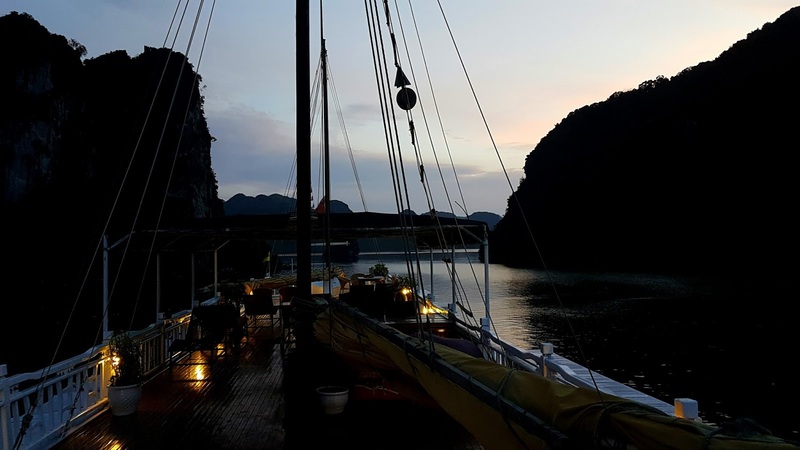 As it approached evening we went swimming off the side of the boat, but after a jellyfish scare swimming didn't last much longer, and we were contented with a huge dinner of Vietnamese dishes followed by sunset and moonlit views of the bay. 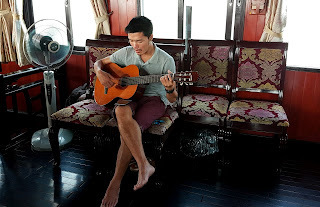 As the evening drew to a close a crew member treated us to a song while playing his guitar. 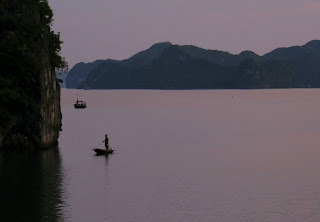 A magical time and I would thoroughly recommend at least one night on the bay. 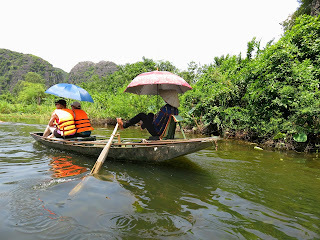 I doubt a day trip would have been as satisfying. 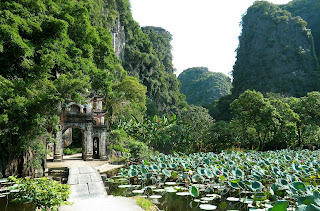 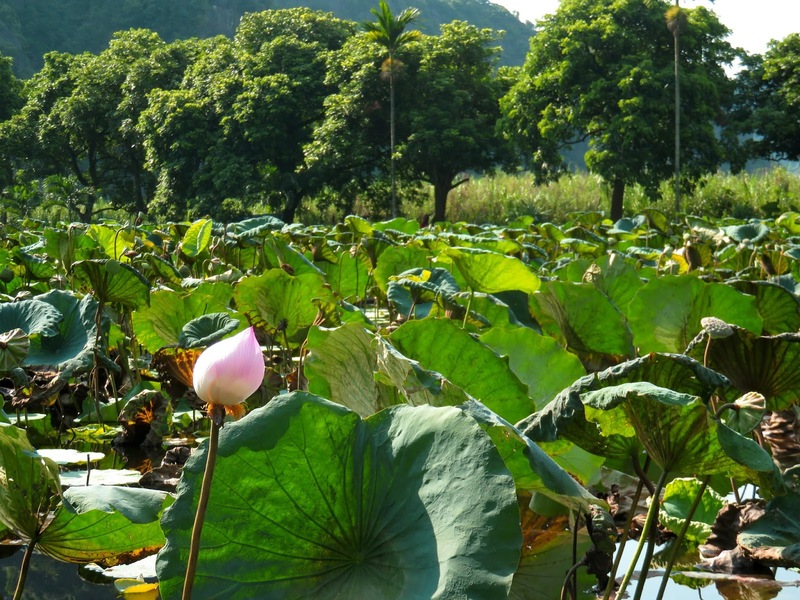 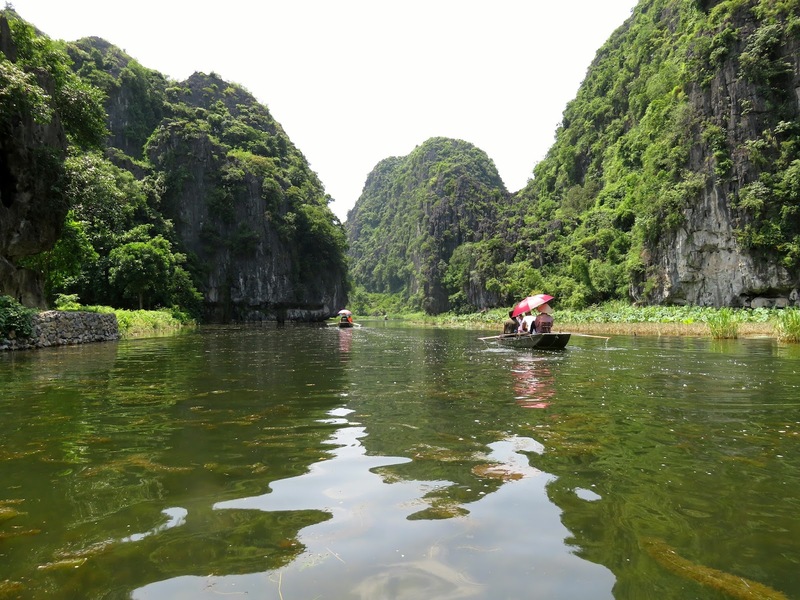 Tam Coc in the Ninh Binh Province is well known as the Bay of Descending Dragons on Land (or the more common title Ha Long Bay on land). 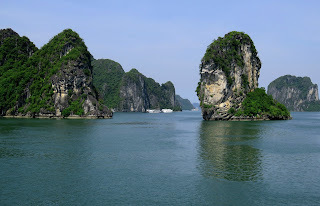 This is predictably because it has the same feature of green topped rock formations sprouting out of the ground everywhere. 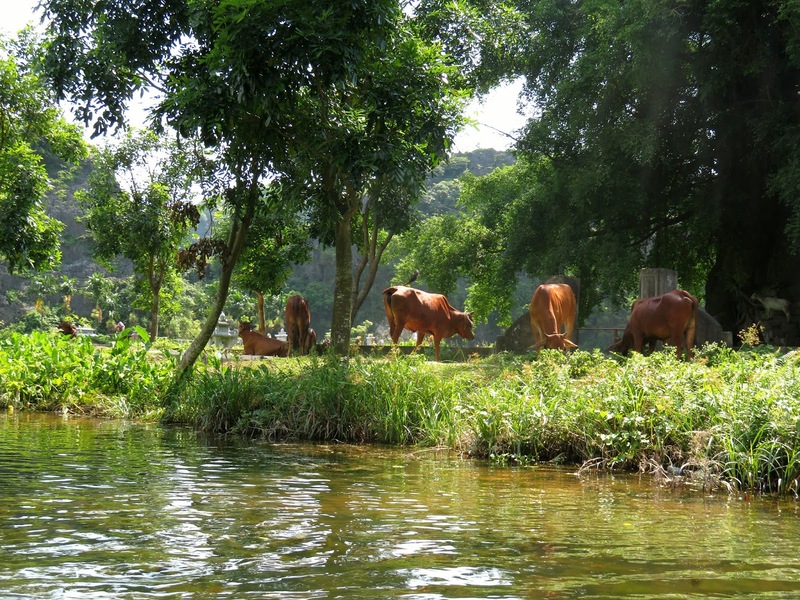 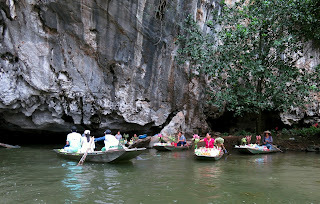 The best way to see them is on a boat ride on the river that goes through three natural tunnels. 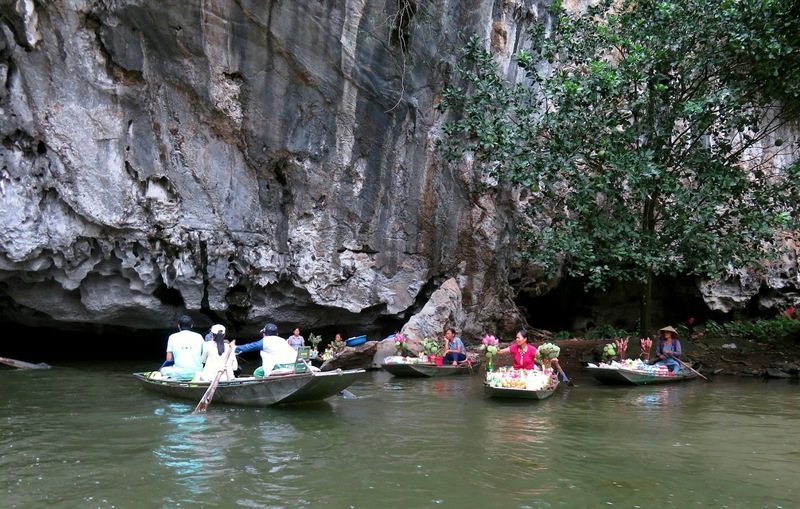 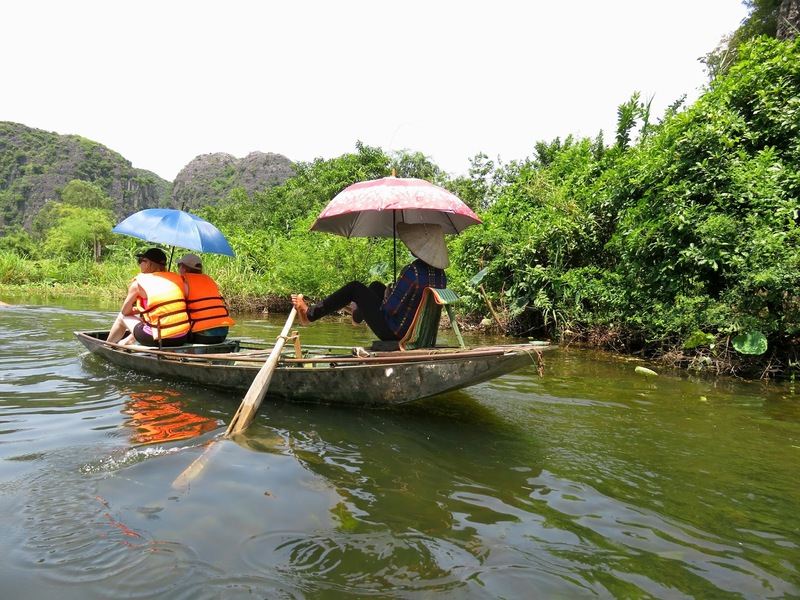 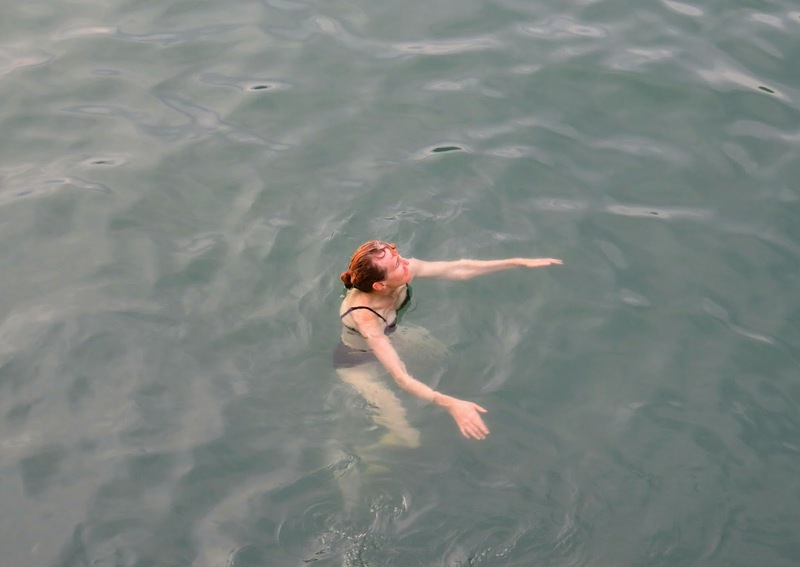 The boat ride itself is part of the adventure as they are rowed by women who mostly use their bare feet. 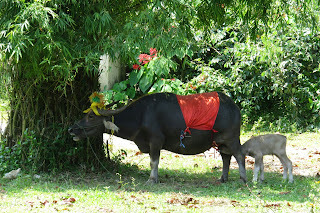 They are incredibly adept and fast and it is quite a unique spectacle. 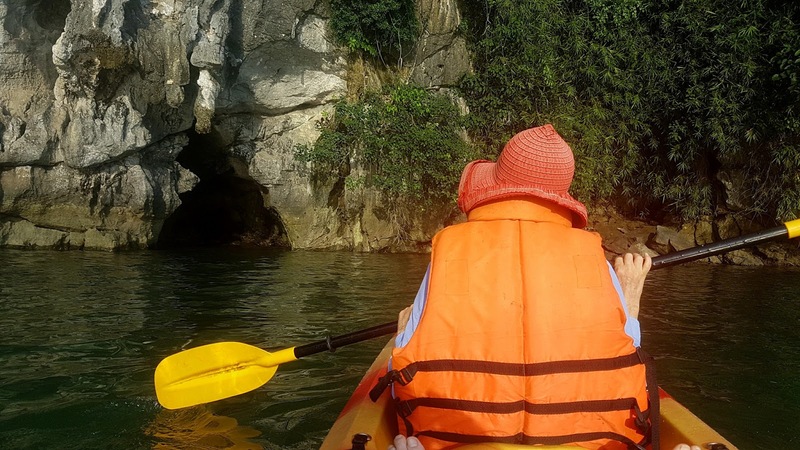 While pondering this feat your senses are assaulted by amazing scenery and the rocks jutting out all around you when suddenly she rows you right into a cave. Dark and low you are ducking the rocks that seem inches from your head and then you come out into the sunlight on the other side. 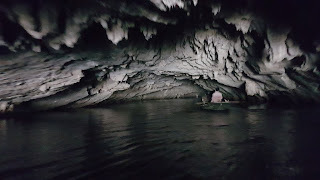 There are two more caves before you turn around and come back again. It's worth coming to this area for that boat trip alone. 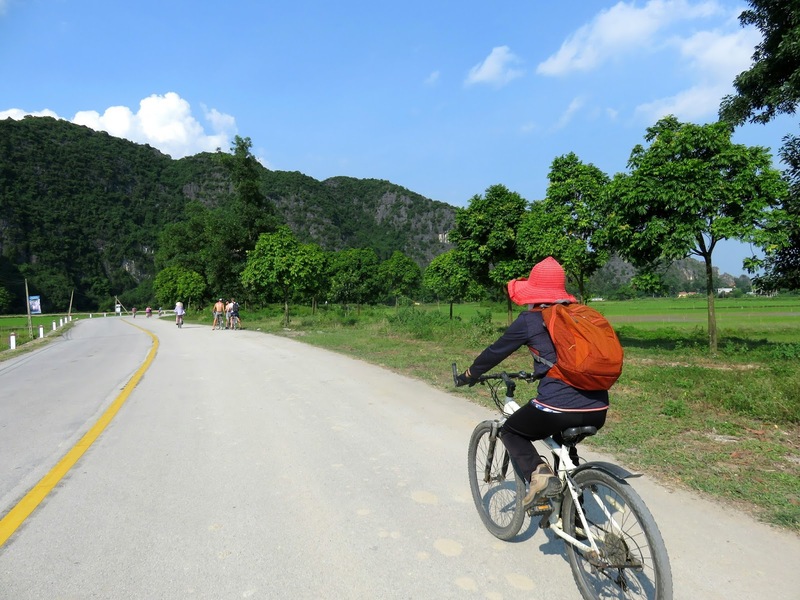 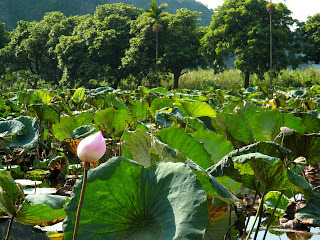 We then went by bicycle for about 3km on roads with more stunning scenery to the Bich Dong Pagoda. This 15th century pagoda is built into the side of a mountain on three levels and is a fascinating amalgamation of ancient monuments with the natural environment.